For some of the 500,000 New Yorkers who use the city's 700 public basketball courts, pick-up basketball in the city’s parks is more than just a game -- it’s a way of life. In their new documentary Doin’ It In The Park, legendary hip-hop DJ and street ball aficionado Bobbito Garcia and acclaimed basketball photographer Kevin Couliau traveled to courts throughout the five boroughs to uncover the story behind New York’s thriving culture of pickup playground basketball. The film features playground legends like “Pee Wee” Kirkland, “Fly” Williams, God Shamgod, Tim “Headache” Gittens and Corey “Homicide Williams, as well as former NBA stars Julius “Dr. J” Irving, Kenny Smith and Kenny Anderson. Filming at 180 courts in 75 days, Garcia said he was amazed at the diversity of players and different styles of playing he found across the city. 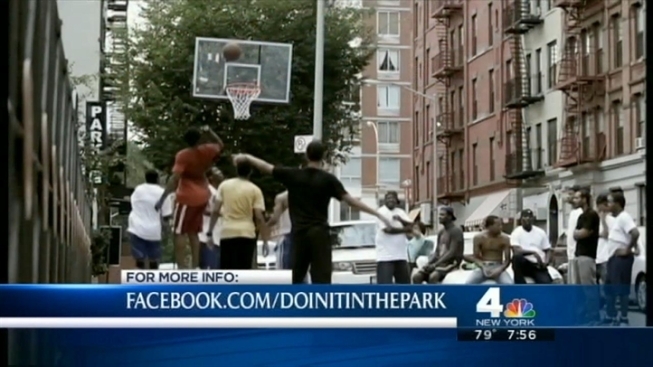 DOIN' IT IN THE PARK: PICK-UP BASKETBALL, NYC - Trailer from Doin' It In The Park on Vimeo.